Football legend and “LIVE! 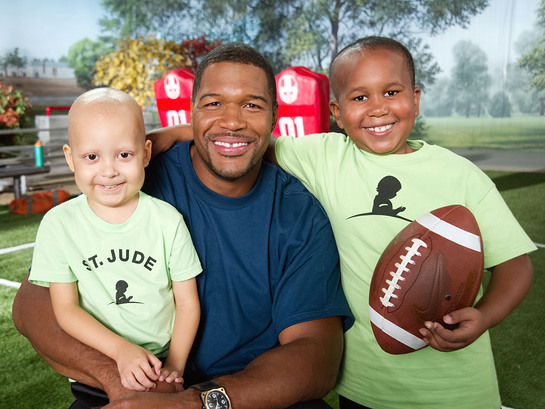 with Kelly and Michael” host Michael Strahan and St. Jude Children's Research Hospital are drafting football fans to party with a purpose on Feb. 3 by hosting St. Jude Game Day. Give Back. celebrations to raise funds that ensure that no family ever pays St. Jude for anything. Michael Strahan celebrates St. Jude Game Day. Give Back with patients Estevan and Marion to prepare for the big game. St. Jude Game Day. Give Back. brings fans of all ages together around the sport they love to help kids battling cancer and other deadly diseases. In just two years, thousands of parties hosted across the country have raised more than $2 million for the lifesaving mission of St. Jude. St. Jude’s groundbreaking research helps kids like 9-year-old football fan Marion, who was sidelined by a brain tumor in 2011 but still manages to cheer on his favorite team, the New England Patriots. Today, Marion’s tumor is stable thanks to radiation therapy provided by St. Jude doctors that targeted his cancer cells and spared the healthy parts of his brain. People can register their party today at stjude.org/gameday and gain instant access to a personal fundraising page, delicious tailgating recipes created by St. Jude’s award-winning chef and a variety of party-planning tips. New this year, SPX has donated “the ultimate tailgating truck,” a Ford F-Series valued at $50,000 that was auctioned at the Barret-Jackson Auction on January 18th to benefit St. Jude. The truck is currently wrapped with a special St. Jude Game Day. Give Back. paint scheme and the winning bidder will receive a wrap of his or her favorite sports team. The truck features a tailgate cover that unfolds to reveal several custom features including a large flat screen TV, satellite dish, top-of-the-line grill, stereo system, sink, beverage dispenser and more. Fans can give back by joining Michael and the St. Jude team and helping give kids like Marion a chance to experience a lifetime of game days. Visit the website to learn more, become a party host or make a donation.